Diabetes mellitus is a group of metabolic diseases characterized by high blood sugar (glucose) levels, either because the body does not produce enough insulin or because cells do not respond to the insulin that is produced. Diabetes mellitus, commonly known as diabetes was first identified as a disease associated with "sweet urine," and excessive muscle loss (Unusual weight loss). Elevated levels of blood sugar (glucose) lead to spillage of glucose into the urine, hence the term sweet urine. Normally, blood sugar (glucose) levels are tightly controlled by insulin, a hormone produced by the pancreas. Insulin lowers the blood glucose level. When the blood glucose elevates (for example, after eating food), insulin is released from the pancreas to normalize the glucose level. In patients with diabetes, the absence or insufficient production of insulin causes hyperglycemia. Diabetes is a chronic medical condition, meaning that although it can be controlled, it lasts a lifetime. The early symptoms of untreated diabetes are related to elevated blood sugar levels and loss of glucose in the urine. High amounts of glucose in the urine can cause increased urine output and lead to dehydration. Dehydration causes increased thirst and water consumption. Over time, diabetes can lead to blindness, kidney failure and nerve damage. These types of damage are the result of damage to small vessels, referred to as microvascular disease. Diabetes is also an important factor in accelerating the hardening and narrowing of the arteries (atherosclerosis), leading to strokes, coronary heart disease and other large blood vessel diseases. This is referred to as macrovascular disease. To understand diabetes, it is important to first understand the normal process by which food is broken down and used by the body for energy. Our body needs insulin in order to change the sugar from food into energy. Glucose is a simple sugar found in food. Glucose is an essential nutrient that provides energy for the proper functioning of the body cells. Carbohydrates are broken down in the small intestine and the glucose in digested food is then absorbed by the intestinal cells into the bloodstream and is carried by the bloodstream to all the cells in the body where it is utilized. However, glucose cannot enter the cells alone and needs insulin to aid in its transport into the cells. Without insulin, the cells become starved of glucose energy despite the presence of abundant glucose in the bloodstream. The abundant, unutilized glucose is wastefully excreted in the urine. Insulin is a hormone that is produced by specialized cells (beta cells) of the pancreas. In addition to helping glucose enter the cells, insulin is also important in tightly regulating the level of glucose in the blood. After a meal, the blood glucose level rises. In response to the increased glucose level, the pancreas normally releases more insulin into the bloodstream to help glucose enter the cells and lower blood glucose levels after a meal. 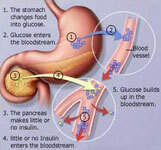 When the blood glucose levels are lowered, the insulin release from the pancreas is turned down. It is important to note that even in the fasting state there is a low steady release of insulin than fluctuates a bit and helps to maintain a steady blood sugar level during fasting. In normal individuals, such a regulatory system helps to keep blood glucose levels in a tightly controlled range. As outlined above, in patients with diabetes, the insulin is either absent, relatively insufficient for the body's needs or not used properly by the body. All of these factors cause elevated levels of blood glucose (hyperglycemia). Type 1 diabetes is usually diagnosed in childhood. In this disease, the body makes little or no insulin. Daily injections of insulin are needed. In type 1 diabetes, the pancreas undergoes an autoimmune attack by the body itself and is rendered incapable of making insulin. The exact cause is unknown. Genetics, viruses and autoimmune problems may play a role. Type 2 diabetes is far more common than type 1. It makes up most of diabetes cases. It usually occurs in adulthood, but young people are increasingly being diagnosed with this disease. The pancreas does not make enough insulin to keep blood glucose levels normal, often because the body does not respond well to insulin. Many people with type 2 diabetes do not know they have it, although it is a serious condition. Type 2 diabetes is becoming more common due to poor eating habits, increasing obesity and failure to exercise. Gestational diabetes is high blood glucose that develops at any time during pregnancy in a woman who does not have diabetes. Women who have gestational diabetes are at high risk of type 2 diabetes and cardiovascular disease later in life. Blood sugar concentration or blood sugar (glucose) level is the amount of glucose (sugar) present in our blood. Our body maintains the blood glucose level at a reference range between about 3.6 and 5.8 mmol/L (64.8 and 104.4 mg/dL). The human body naturally tightly regulates blood glucose levels as a part of metabolic homeostasis. The mean normal blood glucose level in humans is about 4 mmol/L (72 mg/dL), however, this level fluctuates throughout the day. Glucose levels are usually lowest in the morning, before the first meal of the day and rise after meals for an hour or two by a few grams. Blood sugar levels outside the normal range may be an indicator of a medical condition. A persistently high level is referred to as hyperglycemia; low levels are referred to as hypoglycemia. After checking many sources, we found that that there is a variation in the values considered by some as normal. Summarizing the results, including those published by the American and Canadian Diabetes Associations are as follows and where fasting is usually meant as an overnight 8 hour period without food or liquids other than water. Fasting blood sugar levels measured after about 8 hours without food or drink other than water should be less than 6.0 mmol/L (108 mg/dL) but no lower than 4.0 mmol/L (72 mg/dL). Blood glucose measurement units: American blood laboratories use a different version of the metric system than does most of the rest of the world. American system (mg/dL) generally uses mass per unit volume (milligrams per deciliter of blood). On the other hand the SI system (mmol/L) - in Canada, UK, Australia, Europe and other countries - uses moles per unit volume (millimoles per liter of blood). Prognosis: Diabetes can lead to serious complications and premature death but those who have diabetes can take steps to control the disease and lower the risk of complications. With good blood glucose and blood pressure control, many of the complications of diabetes can be prevented. Studies have shown that strict control of blood sugar, cholesterol and blood pressure levels in persons with diabetes helps reduce the risk of kidney disease, eye disease, nervous system disease, heart attack and stroke.